It's becoming more and more difficult to write the Seth Rich murder off as just a conspiracy theory. Kim tweeted at Google administrators, asking them to reveal the contents of Rich’s gmail accounts to Wikileaks. Kim once told Rush Limbaugh he intends to appear on his radio show to discuss the evidence. Sean Hannity has invited him on his show. A second person also came forward last weekend, anonymously posting on the /pol/ political channel of social media bulletin board 4chan. They said that that many in D.C. know that Rich leaked the emails, but were afraid to come forward. The anonymous person said that the DNC is terrified. In a second post, the person hints that the labor organization SEIU knows something about his death. Amateur sleuths posting on the 4chan and Reddit found accounts that belonged to Rich. They were fairly easy to identify due to his unique personality quirks. They had names like Pandas4Progress. His posts reflected his preference for Sanders in the election. They also reveal his disappointment with the Democrats’ rigged party system. Strangely, his posts have been edited since his accounts were discovered. His email address was removed from one post — notably the email address identified the anonymous account as his. The owners of a Pandas4Bernie account issued a statement on Monday asserting they are not affiliated with Rich. However, they did include a sentence revealing they believe he was the whistleblower. We may not be Seth Rich, but we can do justice to his life by extending the effects of his work, by honoring the courage of whistleblowers who put their lives on the line to expose the truths that animate our demands for justice, and ultimately to break the power of corrupt, undemocratic elites once and for all over our lives and institutions. The account indicates that some of the people behind the account are active participants in #JusticeForSeth, an effort trying to solve his murder. The amateur sleuths on the bulletin boards have put together many revealing pieces of information related to the DNC emails and Rich’s murder. The police report showed that at least three of the responding officers wore body cameras. Where is that footage? Rich was alive when they appeared on the scene. The EMTs who treated him told Rich’s parents later that they were surprised he did not live. Rich acted confused however, because when he was asked where he lived, he gave a previous address. Someone claiming to be a doctor who treated Rich after he was taken to the hospital posted an anonymous comment on Reddit. The commenter asserted that Rich’s condition was stable at the hospital. But then medical staff was told not to attend to him. The manager of the bar where Rich was last seen before his death said police never contacted the bar. The bar had surveillance video the police could have requested. After Rich’s death, his girlfriend told a local news station she thought he was murdered “out of anger.” The D.C. police chief at the time was known for hobnobbing with the Clinton campaign and DNC officials. Julian Assange, the owner of Wikileaks, has hinted several times that Rich is the insider who leaked the DNC emails to Wikileaks. Less than two weeks after Rich was murdered, Wikileaks tweeted that it was offering a $20,000 reward for information. In another cryptic tweet on Monday, Assange presciently hinted that someone outside of Wikileaks might identify Rich as the source. Assange also uses the hashtag #SethRich in his tweets about him. Fox News pulled the article on Tuesday. The left is also putting pressure on Fox News and Sean Hannity’s advertisers to stop his ongoing coverage. Rich’s family has asked people to stop their investigations, calling it conspiratorial. They hired a spokesperson who handles crisis communications for Democrats, Brad Bauman. They suggested pressuring Wikileaks to reveal its evidence of the connection to their son. Strangely, Bauman convinced them not to. However, in this video, Rich’s parents profusely thank everyone who has been trying to find the murderers. 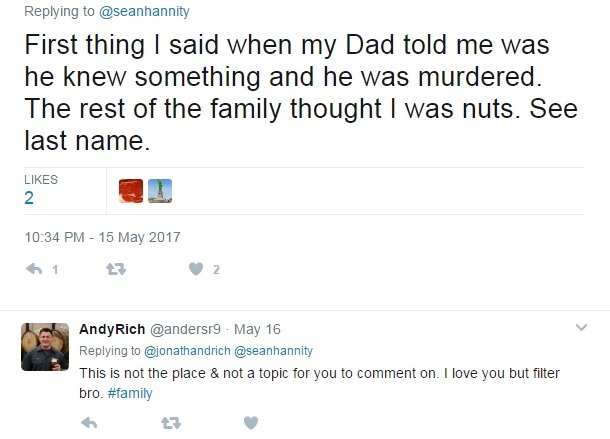 A Nathan Rich, who claims to be a cousin of Seth Rich, has been tweeting about the likely connection. In one tweet, he raised his suspicions. Another family member responded and admonished him for the tweet. He deleted it, but it has been archived. The Democrats and their allies in the mainstream media are trying to shut down the investigative work, labeling it as conspiracy theories. But they don’t control the evidence. At this point, there’s more evidence that the DNC emails were leaked to Wikileaks than that the DNC was hacked by Russia. Congress and the FBI should at least expand their probe to question Assange and Dotcom. Mr. Bauman is referring to you, Rachel. He’s trying to squelch the investigation into who murdered Seth Rich. I think he’s the one who should be worried about his conscience. Rachel, the family prefers that professional investigators handle the situation and would rather not have to deal with armchair sleuths like yourself who spread falsehoods for clicks and political gain. My goodness, have a heart. Who is “we?” Whom do you represent? No, you are flaming the conspiracy theory – and after Fox’s retraction it is especially noxious. A group that apparently does not include his own parents. You are just like “Sandy Hook Truthers” and the rest of the RW noise machine – you will mow down any number of honorable and decent people in the service of your fascist ideology. Ooooo, the “f” word, how original! You are proving my point. How much are you getting paid? His parents are grief stricken people who haven’t been given a clue what happened to their son. Enough time has passed for DC Police to at least provide them some information. Why are you so eager to keep them from getting the truth? The police are going to do that. You’re doing a great job of making sure that the actual perp can get off by distracting everyone with this nonsense. You must really believe you (and the rest of us commenting) have great power and will make sure “…the actual perp can get off…” But keep trying to come up with different memes, it’s entertaining. Keeping conspiracy theories alive and not letting the real detectives do their work damages the country. When people believe conspiracy theories, it affects their perception of reality. It can affect how they vote. It affects our democracy. Who is not letting the real detectives do their work? A bunch of people commenting on websites? Rachel is a former prosecutor; she lives in the real world….not the world where web commenters believe other web commenters affect criminal investigations. The fact that the media and certain elements of the Democratic party (Hillary supporters) are getting hysterical over web conversations tells me that there is something there. Perhaps it wasn’t a botched robbery…perhaps whoever murdered him got what they were after – a thumb drive with damaging info. Seth Rich was a Bernie supporter and we know for a fact that Hillary’s machine had the primaries rigged from the start. I was not a Hillary supporter for one thing. I voted for her as a second choice. And, conspiracy theories DO damage our democracy. If enough people believe unfounded stories, they will vote on that basis. “Those of us?” You should speak for yourself. And you have evidence that I have been paid? You are absurd. I really fear for democracy and our open society when so many believe innuendo and ‘alternative facts’. It does not bode well. I agree. That’s why this whole “Russia influenced our election” waste of taxpayers’ money is disturbing. I fear for democracy and our open society when character assassinations take place daily in the press just because someone’s candidate lost. It does not bode well. However, I think the way in which Trump won (and I’m not debating that he won) really tainted this presidency. He was extremely bullying on the campaign trail to others (and continues to be so). And the cloud of “Russia” and their interference hanging over his head really does taint his legitimacy in the minds of a great many. You may or may not believe this, but I can tell you many feel that way. My goodness, what a horrible thing to post. We are not all Seth Rich. You need to put your self-righteousness aside and imagine what the Rich family is going through. They are sick and tired of having to deal with heartless souls like Sean Hannity and Rachel Alexander. Just read the family’s letter. Nobody gives a crap? How dare you say that about the Rich family. Brad Bauman is right. There is a special place in hell for the likes of you. You can go to the family’s gofundme page. They say as much. They are speaking for themselves. Thanks for your effort to remind writers at an allegedly Christian website of your duty. Your efforts will not bear fruit, but I wanted you to know that someone else noticed. Karen, please keep your ignorance to yourself…. Christians can’t be too lazy to seek truth…. Its not our fault you haven’t or won’t do your homework…. You are the false witness and maybe paid to be so for all we know…. Great article very well written. I suspect that the truth will come out and it’s not going to be pretty. The idea that Seth Rich wasn’t murdered is absurd. Robbers don’t shoot people in the back and leave. The question isn’t if he was murdered or not but why and by whom. For all intents and purposes it appears that Mr. Rich was the inside source of the released emails. Those emails showed the DNC conspiracy to keep Bernie Sanders out and get Hillary elected. Those emails showed Sanders’ voters and others the truth about their own party. In response the democrat party invented the Russian narrative to take the focus off of the truth that was revealed and refocus their constituents on alleged foreign involvement. Believe or not, robberies are interrupted and foiled. Imagine that. I’ll leave the imagining to you. It’s apparent you have a talent for it. Regardless of your imagination that was not the case with Seth Rich. But I suspect that you can imagine that someone interrupted the shooting the imagined robbers ran away and the imaginary witness joined them. A broken watchband is a figment of no one’s imagination. You need to do your homework with this story and stop thinking there is no such thing as a botched robbery. So your imaginary thieves broke his watchband and left the watch. I suspect you imagine that they left the watch because the watchband was broken. Who wants a watch with a broken watchband, eh? Did your imaginary witness who interrupted the imaginary robbery and caused the imaginary robbers to flee verify this? Now how do you know they left the watch? You’ve got all the answers. Let me guess. You’re making it up. If there was a torn watchband , as you claim, there was likely a watch. Unless of course you imagine that someone tore the watchband, removed the watch, and left the torn watchband. As the parents were not there how did they conclude that there was more than one assailant and that said assailants attempted to rip his wristwatch off of his wrist? Maybe you imagine his parents interrupted your imagined robbery and that they are the witnesses that you imagine ran away before the police arrived? Hows that work for you? I have no idea what happened. And neither do you. Why do you insist on concocting scenarios and being a part of the mob that is inflicting grief on the Rich family? It’s been obvious that you have no idea what happened yet somehow you found it necessary to verbally assault the author of the article with your imagined scenario revolving around a damaged watchband being your evidence that it was a “botched robbery attempt”. I would like to see the murder solved and the perpetrator or perpetrators punished. I would like to see the family get closure. Why would you want the family to suffer never knowing why their son was murdered or who committed the crime? 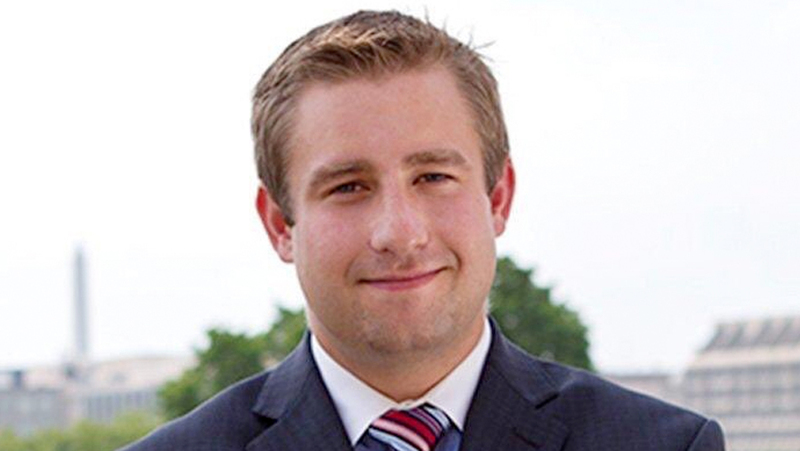 If in fact it does turn out that Seth Rich followed the courage of his convictions to get the truth out on the DNCs collusion with the Clinton campaign to assure that Sanders was not the nominee and as a consequence was murdered, he would have died a hero. After all, the information that was revealed was the truth. The dialogue that it was Russian interference in collusion with the Trump campaign just provides cover for the perpetrator but if that was the case and it was the “Russians” we should be thanking the Russians for revealing the truth regarding the dirty dealings within the party. Personally, I would rather thank an American patriot than a Russian hacker. No matter the outcome, the longer it stays in the public’s eye the sooner the case will be solved. No one is saying they don’t wish the family closure or the murder solved. NO one. But, to make up theories that are far fetched and have been debunked by the police and now retracted by Fox News itself, well, that borders on cruel to the family. It sullies the name of their son with no proof. That is emotional pain heaped on top of the loss of their son. Stop playing armchair detective and let the real detectives do their work. Sullies his name? Revealing the truth “sullies” one name? Quite frankly it would take great courage if he did give those emails to wikileaks. What would sully ones name is knowing the truth and allowing the blatant corruption to continue unchecked. Only in the fertile imagination of a person intent on obscuring the truth would telling the truth sully ones name. You are a nutcase. Why would I want the family to suffer? That’s the impression you get from my posts? Nutcase. They left his watch because they broke the wristband. But they also left his wallet with his credit cards, cell phone keys, or necklace worth $2,000 because…. I’m sure his imagination will come up with something. Past that, I look forward to your continued reporting on this subject. Thanks, I suspect he’s a paid troll, and that’s my next article coming out on this. The coordinated comments across multiple articles and platforms that all say the same thing, but with different usernames…must be nice to be paid by George Soros to get to sit around in your pajamas eating cheetos in your parents’ basements (who pay for your main expenses) while you copy and paste what you’re paid to say and slam conservatives and squelch murder investigations into YOUR OWN. You underestimate the resistance. We are not paid. I know of NO ONE that is paid. That is another conspiracy theory. When the right doesn’t like facts, it jumps to conspiracy theories. What about the Koch Brothers on the ‘right’? They pay VAST amounts of money to promote their views. And, if Soros wants to fund activities that promote justice, education, public health and independent media, that is quite fine by me. But, he does NOT pay individual people to protest. PROVE IT. The Koch Brothers have a huge financial and political influence on United States politics. They spend their money on that. It is hypocritical for the right to always bash Soros when their ‘guys’, the Koch Brothers, use their money in the way they do. I will further state I am a 63 year old woman. Maybe old enough to be your mother. I live in no one’s basement. I am paid by no one. I am not surprised, given your writings, that you found yourself in the predicaments you did in the past. Your comments and views aren’t very lawyerly. Who knows, Rachel? You make it sound as if there no such thing a botched robbery attempt. And that is ridiculous. How do you know ‘robbers don’t shoot people in the back’? Likely depends on where they were standing. Perhaps Seth tried to run away. We don’t know. Maybe the robber didn’t want the victim to see his face. Maybe it was just happenstance. You are making a huge leap to say that this young man, a DNC staffer, was responsible for this ‘leak’. I’d say it exactly the other way round. This story was invented as an ‘alternative fact’ with no proof to take the pressure off the “Russian narrative’. Okay, I’ll play perhaps with you. Perhaps in trying to obscure the facts contained in the DNC emails and turn the focus elsewhere it has become more convenient to imply it was Trump’s doing. I am simply reporting what the CIA and FBI have said. anne55, you are behaving very much like a paid troll as I read your comments. In fact, there is NOTHING written here in this whole forum that you can agree with. Why do you even come here ? Maybe your life will be more blissful without coming here. Try offline for 30 days and see whether I’m right. Ha! If anyone wishes to pay me for my contributions here, please feel free to do so! No one has ever made that offer. Kim Dotcomm should shut his trap up unless he presents evidence. He is despicable if he is lying. There is a commandment about “not bearing false witness.” You would do well to re-acquaint yourself with it. At this point, there does not seem to be any conclusive public evidence of anything with regard to Rich being the leaker other than that one side or the other is lying. The only thing we can say with certainty is that Rich was murdered almost two weeks before Wikileaks published the e-mails. Thus, the likelihood of his death being related to all of this is very low–and without his death to tie it all together, the case looks rather flimsy. Why is that? A 2 week delay in release of the emails indicates that Wikileaks VERIFIES material before they publish it. I’m no fan of #45 either but I’m not going to dismiss the murder of a young man as a botched robbery, when the sellers of that “theory” have been proven to be corrupt. The “Russians” angle fell apart when the FBI admitted that they relied on a report from CrowdStrike from last July to determine the hack. As did ALL other agencies. THEY NEVER EXAMINED THE DNC NETWORK. The only one involved in this that hasn’t been proved a liar is Jillian Assange. He has indicated that Seth Rich died for a cause. If the cause was exposing political corruption, I don’t care if it’s Dems or Reps, he should get justice. Incidentally, that would be the same DNC then headed by DWS, who as the story we just posted from the Daily Caller News Foundation, has no problem trying to block investigations that operate against her interests. Not quite sure what Wikileaks verifying the material has to do with this, but the point I was making is that at the time Rich was killed, the Democrats had no idea that Wikileaks had their e-mails. They were blindsided when Wikileaks published them. The implication we’re all dancing around is the idea that Rich was killed in retaliation for the leaks. But at the time of his death, that motive did not exist. The timeline simply does not match up. How do you know that the DNC did not discover the leak before Wikileaks posted them and his murder was an attempt to stop the transfer? The DNC’s response to the Wikileaks dump was not that of a group that knew it was coming. They were blindsided. That is why the FBI and the CIA continue to pursue the investigation, to see where it leads. They’ve both said it is very much an active investigation and it is now being termed a ‘criminal investigation’. So, hold on for a minute. Why would Republicans, conservatives and Christian evangelicals NOT be concerned about a not friendly foreign power run by essentially a dictator intervening and trying to influence our election? How do we know that they aren’t still involved in trying to influence our politics? How do you know that they won’t try again in 2018 or 2020? I must say this is the kind of thing that Republicans are typically MORE concerned about than even Democrats. But, because of what it might mean for Trump and (by default) the Republican Party, they are turning a blind eye. It is party over country at the moment. It is what they “wish” things would be rather than following facts and truth. That is not okay. I assume you weren’t concerned when Obama provided US taxpayers’ funds to one of his political organizations in an attempt to oust the sitting Prime Minister of Israel a few years ago? Or were you concerned when Obama tried to influence Great Britain’s BREXIT elections? John Brennan, Obama’s CIA Director, testified the other day that Russia has been trying to influence US elections for years. I guess it was OK when you were happy with the outcome. I doubt you even know the “facts and truth,” when you obviously support someone who is a convicted felon (Soros). Good grief. #2 Why is it wrong for Obama to voice his opinion on Brexit? As long as it is HIS opinion and stated as such, then he has the same right to free speech that we all have. Certainly many world leaders voiced their opinions when Donald Trump was still the GOP front runner. And many were not very nice opinions. http(colon)(slash)(slash)www(dot)telegraph(dot)co(dot)uknews(slash)2016(slash)04/21(slash)as-your-friend-let-me-tell-you-that-the-eu-makes-britain-even-gr(slash) It is not illegal. #3 I did not hear Brennan say this, but (if true) I was unaware of it – and it is even more reason we should be very concerned as Americans. And, I wasn’t always happy with election outcomes. Yes, I like Obama. Wasn’t thrilled about Bush the 2nd, but I never complained. Trump is in a league of his own. #4 I don’t condone insider trading (fyi, this conviction came from France, not the USA). But, I do condone a lot of other things Soros has done. He paid his fine (2.3 million). But, speaking of criminal activity, do you know that the Koch Brothers (beloved conservative funders), were ALSO convicted of criminal activity? To a much greater sum of money? “From 1999 through 2003, Koch Industries was assessed more than $400 million in fines, penalties and judgments. In December 1999, a civil jury found that Koch Industries had taken oil it didn’t pay for from federal land by mis-measuring the amount of crude it was extracting. Koch paid a $25 million settlement to the U.S.
Koch’s refinery unit pleaded guilty in 2001 to a federal felony charge of lying to regulators and paid $20 million in fines and penalties.” Sorry to one up you! You seem to think I support the Koch brothers, so perhaps your masters told you to assume I’m a Republican because I want the truth. The Koch “machine” is as evil as Soros and every other multi-millionaire/billionaire who buy elections, pay for people to comment on websites, pay for people to pressure advertisers to drop TV shows, etc. etc. etc. Your support of Soros tells me a lot about what kind of person you are. That’s your burden to carry, so you can stop with the talking points. I voted for Bernie Sanders in the Primaries because Hillary is a crook, much worse than Koch/Soros/Steyer/etc. etc. Al Qaeda and the Taliban also provide(d) money to poor people; do you excuse their horrible mass murdering? Well, I am glad to hear you don’t like big money in politics. Neither do I. We have something else in common. I also voted for Bernie in the primaries and am an independent. So, there were assumptions going on here on both sides. I DO like Soros support of education, the ACLU, journalism, human rights. I don’t have a problem with that at all. Fox News has retracted their story, without apologizing to the family. Fox News announced Tuesday it had retracted a story published last week that reignited conspiracy theories around the unsolved killing of Democratic National Committee staffer Seth Rich, whose family demanded an apology from the conservative news network. So, totally retracted, but no apology for besmirching the reputation of this young man who can’t talk for himself. Ms. Alexander – I just noticed your publication piece’s date (today). However, you should update your article based on the information the story was detracted today – and pretty much debunked previously anyway. I did address that in my story. My description of it got edited out however. Basically, the Fox News article that was retracted did a poor job of noting that Detective Wheeler’s comments were based on the anonymous federal investigator’s observations of the case. Detective Wheeler clarified this the next day on Hannity’s TV show, explained that he had not actually personally seen the case file and emails. So Fox News should have merely issued a correction. It wasn’t anything major enough to have pulled the story. The story is just plain false. There is no evidence except conspiracy theories from some Republicans who want someone else to blame the ‘Russian thing’ on. Actually, the suspicions about Rich’s death were out there long before the Brit in the pay of the Clinton operation began peddling the “Trump dossier” to the FBI, which triggered the surveillance, the widespread unmmasking, and the leaking and the whole Russia canard. It was the Republicans that didn’t like Trump and didn’t want him to be the party’s nominee that ordered the dossier. It doesn’t say who the Democratic client was, but the Republicans initiated this. Troll alert! Troll alert! Don’t waste your time reading this crap. Boy, I can’t say anything truthful without the name calling from you. If you are in disagreement with a point I make, why don’t you just say why and offer some collaborating proof? Name calling doesn’t really get you anywhere. You know, I just looked up your comments to a number of people via clicking on your name and it seems like your major argument to most of us with differing viewpoints is shouting “Troll”. That really is very unbecoming and a veiled threat to free speech. Rachel, thank you for reporting on this. Don’t let cowards hiding behind computer screens intimidate you into silence. Again, thank you for reporting on this. Thanks for the kind words. I actually have an expose on these folks coming out shortly. I’m noticing a pattern of paid trolls. Cool. I’d like to see some insight on that. Some people seem to have way too much time to post as much as they do. Maybe you are speaking for yourself as well? So I’m a paid troll, trolling a conservative Christian site that I’m strongly in agreement with? Got it. I don’t believe for a minute that anyone is paying you. And, I do believe you are strongly in agreement with much of this site. I hope people also believe no one is paying me and that I want to have conversations with people of differing points of view. You insinuated that I’m a paid troll and trolling on this site. Where did I say any such thing? You said some people have too much time and I responded. Frankly you are on here just as much as I am. Maybe more. Oops, my bad. Please forgive me. I thought I posted something different than what I did. Busy little Troll today aren’t we? Must be really important to try to squelch this story! Yes, it is important because it is false, it is hurtful to a family and spreading disinformation hurts our democracy. This story just spreads like wildfire when all are in agreement. And you will continue to see them. The enemy spends his efforts on those who are making a difference in the fight; that’s why I see them a little and you see them a LOT. You are making a difference. Don’t stop! Rachel, please don’t feed into this nonsense about paid trolls. Again, it is paranoia on the part of people that may not agree with your position. FYI, I also do a little research on the background of people who write these articles – part of my credibility search if you will. I am aware of your’s but will say no more. This isn’t a report. It is an opinion. How can you continue to push this story when all evidence points elsewhere…and when the main reporters of the story (Fox) have retracted it? Troll alert! Troll alert! Don’t feed the trolls! It only makes them think they are part of the conversation. Ditto this post above. It is a way for people having one viewpoint just to dismiss differing viewpoints. Reminds me of kids on the playground – bullying really – when they want to put down other kids. But, sadly, it is adults engaging in similar juvenile behavior. Just ignore everything in my article and keep asking for “evidence.” As a former prosecutor, I actually find your comment hilarious. As if you can’t convict based on circumstantial evidence – and that’s in a court of law, a high bar! There isn’t enough circumstantial evidence here to get any kind of conviction. I’m not even a lawyer and I can see that. When I first read about his death I made the connection. The Clintons have been surrounded by “mysterious deaths” for over 30 years. Wow suddenly so many newcomers here ! Some maybe paid trolls, especially those who are always opposing. Why do you call someone with a differing point of view a ‘troll’? That is just name calling when you don’t like someone else’s opinion. It is a distraction from having a back and forth, honest discussion. Anne55, back and forth honest discussion means you admit where your wrong. You’ve caught me a few times. You have never admitted you have been wrong on ANY point. I just, a few minutes ago, apologized to Jim Walker for assuming he was referring to me. It was before I saw this post from you. And, I have said when I was wrong more than once, but I’ve no idea where those posts are at the moment. A troll normally comes and goes away and find some forum to steal kill and destroy. However, I do hope that you can respect the views of conservative people. They aren’t old fashion, they have a rock solid base of moral principles that anchors deep into a bedrock that endures the changing and destructive times and history. Fleeting thoughts and scholarly foolish opinions that try to shape people comes and goes like fashion. “A rolling stone gathers no moss”. Progressives will eventually shift their opinions and will contradict their previous ideologies. These are not moral values. Moral values do not change with time. A friendly one. I don’t come and go. I am simply trying to present a differing opinion that I hope is also respected. I also have moral values. Some are probably similar to your’s and some may be different. You have also stood with and thanked those who abuse others here on this site simply because we think differently. You have thanked them for their help. I have thanked them for expressing their own independent opinions (i.e. Stan on another thread). He was not abusive. If you are thinking of Tim (on yet other threads), I DO agree with much of what he says, and, yes, he is angry and sometimes very blunt. I get the anger although I don’t think it particularly helps persuade. I’m not sure anything I (or Stan or Tim) say will actually help change any minds. But, you never know. Usually listening and being respectful do help. Otherwise the first thing people hear is the anger, not the words. Sorry, anne55, that’s not good enough. Tim is down right mean. You defend his posts. Not once have I seen you defend those he unjustly attacks… not once. So that put you in agreement that someone coming from a conservative view can be justly mistreated. I defend his point of view, not necessarily the way in which he sometimes delivers it. anne55, not defending someone when they are being abused by someone on your ideological side is complicit acceptance… while he was abusing people you thanked him for his help. You don’t see this as abusive toward me? It is posted right above here. You know, it goes two ways. This doesn’t seem like a very Christian oriented statement to me. anne55, you thanked him for his help in the article where he had done lots of abuse yet not one word from you that the abuse was wrong. That makes you passively condoning his abuse. Instead you defend him by saying he is angry. So, this means you approve of an angry liberal abusing a conservative. This reason is why I stepped in to defend you and Timothy when others were abusive. I did not want to be guilty of the same thing by my silence. You are no less guilty of what Timothy did because you were passive about it. I have posted so much, on so many different articles here, I honestly can’t recall which comment you are referring to – please point it out to me. And, if you think I don’t get my share of ‘abuse’, please just read stevenlehar’s post to me just above your’s. I try to be civil and respectful, yet still express my point of view. I don’t ever name call. That doesn’t do any good. We recognize the pattern, Troll! You come here JUST to piss people off and try to cover up Liberal Lies. We are ON to you guys! Your stuff doesn’t work here any more. Go back to the LibTard sheeple sites where your kind is welcome. This is for reasonable adult conversation! I am not a ‘paid’ troll. I’m here to present a different view because almost everyone else seems to think alike. I wasn’t even referring to you. Well, I wasn’t sure who you were referring to and it seems my opinion is opposite most. So, I assumed. I apologize. Yes the trolls are busy trying to cover this one up! But you notice something? It used to be easy to troll, but now they get SHOUTED DOWN by great numbers of reasonable people. We are all ON to them now. Their stuff doesn’t work here any more. Don’t waste your time debating them, just SHOUT THEM DOWN. That is logic that even Liberals understand. That is why I ask them to go to a Muslim forum and try debating them. MIKE WHITNEY lives in Washington state. He is a contributor to Hopeless: Barack Obama and the Politics of Illusion (AK Press). Hopeless is also available in a Kindle edition. For God’s sakes, how many times do I have to say this?? Fox retracted it story yesterday and said it wasn’t good journalism and ‘not up to it’s standards’. For me, this is just a way for Republicans to detract from the Trump / Russia story – which is THE real story. Rachel, have you read David French take on this over at the national review? Either this is serious fake news or a serious indictment of the DNC. 15 years ago I would brush this off as a conspiracy theory… today it seems very possible. IT HAS BEEN DEBUNKED. FOX RETRACTED IT’S STORY. The story ends when we know who murdered him. Since there are people coming out saying there is something to this theory then someone needs to listen and follow up. Maybe the people coming forward are doing so to stir the pot. I don’t KNOW and neither do YOU. The story is none of our business. It is being used for political purposes. Let the family have peace. Let the DC police and detectives do their job. Unfortunately, solving crimes isn’t always easy. Quote: “Violent crime in America has been falling for two decades. That’s the good news. The bad news is, when crimes occur, they mostly go unpunished. Yup, it’s none of our business if Seth did not transfer the emails. If he did then it everyone’s business. Since you don’t know the truth you can’t make the call. You can’t either. So, I say we all stop writing and talking about this and let the police do their job. I’m not judging either way. If the police aren’t finding the killer then the public needs to get involved. The police aren’t making headway. And for heaven’s sakes – what is the public going to do from their armchairs at home re: helping to solve a murder? But we shouldn’t be making it EVERYONE’s business (as many are) until the police investigation is finished. So, anne55, which theory of man do you subscribe too in John’s article, “This 1962 Novel Predicted Western Collapse and Islam’s Takeover”? I will have to do it later. Memorial Day weekend trip. Fox retracted because of commercial reasons. 2 Advertisers pull out. Whether Fox retracted or not, we all need to push for the truth to be out. Don’t you want the truth ? I’ve not heard that. They wrote it was not up to journalistic standards. That means it was a crappy article, crappy reporting. Where did you hear that Fox News retracted due to advertisers and not journalistic standards? GPS Daddy I’ve not seen such events before when there are so many people who are so blinded by so much falsehoods. Okay, you are right. I am finding references to advertisers pulling out. I actually don’t blame them with all the scandals and shoddy reporting at Fox. Think Roger Ailles, Bill O’Reilly, and now this conspiracy theory about Seth Rich. “The family of Seth Rich wrote a letter to Hannity’s executive producer urging the primetime program to stop pushing the conspiracy theory. “Think about how you would feel losing a son or brother. And while dealing with this, you had baseless accusations of your lost family member being part of a vast conspiracy,” Aaron Rich wrote in the letter, which was provided to CNN. “As the family, we would hope to be the first people to learn about any such evidence and reasons for Seth’s death,” Rich continued. The Rich family thanked Fox for the retraction. “The family would like to thank Fox News for their retraction on a story that has caused deep pain and anguish to the family and has done harm to Seth Rich’s legacy,” a family spokesman told CNN. That is enough for me. Let the police do their job. Frankly, from where I sit, it appears that the much greater likelihood is that they want to dump stuff on a young man who tragically lost his life late at night that rightfully concerns only Russia and the Trump Administration. That is the height of cowardice. Can you for once try to be open about this and research more and not just close the issue pinning the death was just a botched robbery? 2. He wasn’t in critical condition after surgery but some people blocked medical staff from monitoring his condition and give medical care. And he is dead. Doesn’t that tingle your senses ? Or you are just trusting everything you read ? His family may be threatened with harm to push for the truth. The dark powers of govt before Trump will go to all means to stay in power. I’m indicating all the above with “may be”, I’m opened to future updates and hope the truth be told and that’s all I’m asking and hoping. I want you to PROVE to me that they blocked medical staff from monitoring his condition. No legitimate hospital I know of would do that. Prove it please with a reliable news source. anne55 – What reliable news source would you consider reliable ? There are none from the MSM. Fox is the most accurate and believe me I watch all of them. FYI I used to be a Hillary supporter. Remember I ask you to read the news posted here by llatpoh ? MSM won’t air it for sure because they are all on the Dems side. Yes I read and saw the video on Youtube as well. Trolls will say these are conspiracy theories as well. I see the trend. There is nothing they would agree with here, nothing. So, I tried this link. I had two warnings, from two different fact checking sites, that this site is a frequent sponsor of fake news. Notes: The Daily Wire is a politically conservative American news and opinion website founded in 2015 by conservative political commentator Ben Shapiro, who currently serves as Editor-in-chief. Presents news with a right wing bias in reporting and wording. The Daily Wire has also published false information such as this and this from Ben Shapiro. Why are you so shut up! about this? Interesting. While I greatly respect David French, and usually agree with him, I’ve found I occasionally disagree with his opinions. This does not surprise me. He is a bit more opinionated than I am. I prefer to present the evidence and let the readers decide, rather than come out when addressing tough issues like this and decide no, it wasn’t a botched robbery and Wikileaks was involved, or yes, it was a botched robbery and he wasn’t the DNC leaker. Yea, sometimes I agree with him m and other times I think he is out to lunch. Despite this, the main pushers of this conspiracy theory RETRACTED their story. You aren’t paying enough attention to that. The video above of Seth’s parents is taken from a GoFundMe page. They were thanking people for their contributions to help find Seth’s killer. His brother also writes that the Seth’s death is ‘being used for political purposes’ and he is quite upset about it. In light of recent events, I wanted to post a quick update. First and foremost, I wanted to thank everyone for their support in answering the only question that matters- who killed Seth? Being committed to the facts will be what answers that question. To date, we have not used any of the raised funds. As previously stated, we will report when we do. You didn’t read all three pages and Yes, his brother says POLITICAL motives and that they keep getting hurt and used (that sounds upset to me). Ah, I thought I went through all the pages must have missed that one. Higher stakes games are being played. If Seth did not give the emails to Wikileaks then The Stream will owe his family a big apology. In the other hand, if he did then the DNC will owe their family a huge apology even if they did not murder their son. I agree we don’t know who murdered Seth. But, his own family does not want his name sullied without absolute proof. They feel that all this Wikileaks innuendo is a distraction from finding his killer. And Fox News has admitted this ‘journalism’ wasn’t up to it’s standards and based on ‘not much’. OF COURSE, Assange and Russia would LOVE to blame someone else as it distracts and takes the pressure off of them. While I certainly don’t know who killed Seth Rich (no one does), implying that this was a hit job when “no one knows” does the real investigation and the family a disservice. It is also a disservice to finding the truth based on facts. You’re the one saying Seth’s name is being “sullied.” We believe that IF he was the one that exposed the DNC for rigging the primary, then he is a hero. Millions of people wrongly assumed they were voting in an honest election. We found out it was all rigged for Hillary “because she deserved it.” You use the word “sullied.” If he was the one to get the truth out, he is a hero. Depends on what side of the fence you are on. His family is upset by the conspiracy theories. “…we still find our family being used for political motives. Quotes from the Gofundme site. Seth’s brother. It appears folks want to find the murderer as long as the motive has nothing to do with Wikileaks. If you are investigating you have to accept the evidence and keep working backwards from the crime. Not assume a conclusion. Police don’t like unsolved things so it could be they just want to close it. It also could be something else since there is a guy claiming to have evidence. I suggest we see what he has and then judge. There are a lot of folks that are pre-judging. That’s exactly right and that is what they are trying to do. Except these darn conspiracy theories just keep popping up to cloud things. The problem with your logic is that it is backwards. You don’t start out assuming a particular narrative. You look for evidence …any evidence..that will lead you to the truth. You are looking only for evidence based on your belief that Wikileaks and this DNC staffer are connected. You are ignoring other, more logical, explanations. Oh, my god. You’re guy WON and you are still complaining about rigged elections? And every reliable government source says the story isn’t illegal voting…it is voter suppression. He was murdered. Why the enormous DNC interest and the hiring of a spokesperson? Botched robbery, seriously. Unsolved murder would be more accurate and if the DCP just stuck with that until they had evidence they would have a lot more credibility. I mean what investigator does not interview the last person who saw the victim alive? The only ‘enormous’ interest I’ve seen comes from conservative sites. I hear basically nothing from the DNC on this. Give me a link to your claim. The interest is in dismissing Dotcom’s claims, sight unseen as conspiracy and trying to run anyone who reports it out of town. You have to be living in a cave if you can’t see that. I am not interested in the opinions of a man “… accused of criminal copyright infringement and other charges, such as money laundering, racketeering and wire fraud, by the U.S. Department of Justice.” Dotcom denies the charges, and is currently fighting attempts to extradite him to the United States.” Sounds like a real reliable guy, doesn’t he? If he has proof (he has presented none) he can show it from the safety of his home country. He also has legal woes in at least 3 other countries. There is no pressure on Assange? Which makes his claim of an inside job credible. He has no motive to claim otherwise or he could just be completely silent. No pressure on Assange? Are you kidding me? The man is a captive in the Ecuadorian embassy in London. He can’t leave. “Some speculate that Assange, who has said he fears the death penalty were he ever to be extradited to the US, hopes he would be treated leniently by a Trump administration. Others suspect the heart of the matter is the Russian connection: Assange, like Trump, seems strikingly comfortable with Putin. A former host of a talk show on Putin’s propaganda channel, Russia Today, Assange once requested his own private security detail within the Ecuadorian embassy, nominating Russians for the task. This was from an article pre-election. I believe Assange had his own motives. You’re fixated on the answer to all things is Russian. Which we have spent almost a year trying to connect Trump to and I guess we didn’t like the previous team’s failure to find evidence so we had to get a new team. But the answer is that Trump illegally colluded with the Russians and the mission seems to be keep looking maybe forever. You can’t seem to accept that there are other possibilities regarding how Wikileaks obtained the emails. This murder is unsolved. It could be a botched robbery or it could be a hit job. Circumstantial evidence indicates its not a robbery since he wasn’t robbed and was shot in the back twice. Some folks seem to protest too much and wish it to be labeled a botched robbery and move on. Lets see if Dotcom comes up with anything. I found the previous team just fine. Trump, apparently, did not. So, he fired the team head investigating him. That, my friend, is call obstruction of justice. You are right. I can’t accept that a young staffer, not all that high up on the chain of command, would be involved in something ‘this big’. It just doesn’t make any sense whatsoever. Many Bernie supporters switched to supporting Hillary even tho she wasn’t their first choice. I count myself among that group. This just makes NO SENSE. Even Trump has said his firing of Comey was because of the Russian thing. I think Republicans have become totally blinded of late. They can’t see clearly at all. Once again you are pushing your opinion and pass it truth. I think you are a free troll. I respect paid ones more because at least they work for it. Watch Trump say it on this video. I’m not making this up. We debated about this before anne55. I told you to watch the video and you did and still you lean towards your false beliefs. Do some soul searching anne55. I have. That is why I am writing here. I think the evidence heavily stacks towards something illegal with the Trump Administration. And, I’d say they act pretty guilty much of the time. Previously it was “Trump said it”, now its “I think”. I can see you are mincing your words to gain some credibility. There is nothing on Trump, there is no Russian hacking, the only thing that has the name Russian is probably the goulash they ate. Why would the Russians help Trump when Hillary help them to secure 20% of uranium from the US? If I’m Putin, I’d want Hillary to win. Putin hated Hillary. There is plenty of documentation on that. “When mass protests against Russian President Vladimir Putin erupted in Moscow in December 2011, Putin made clear who he thought was really behind them: Secretary of State Hillary Clinton. Behind the allegations of a Russian hack of the DNC is the Kremlin leader’s fury at Clinton for challenging the fairness of Russian elections. I wonder if “anne55” is Chelsea Clinton…or Hillary. I’m not really sure what you mean here. I am reporting the evidence, and allowing the readers to come to their conclusions. Are you saying if it turns out that Rich did turn over the emails to Wikileaks, that you will apologize to us? That response was to anne55, not you. Sorry for the confusion. Father I pray that you give each of us discernment that we may find the truth and that the truth sets us free. The murder is unsolved. The “botched” robbery theory has zero evidence. He wasn’t robbed. Shot twice in the back. None of this adds up to a robbery. It does add up to a murder. The story has not been debunked. The story has been squelched by the media. A lot different than debunked. If there is no connection to wikileaks, why not allow the full investigation of the evidence? Where is the laptop? Why not be transparent regarding the evidence? Because it might not give the right answer which is conveniently botched robbery. Nothing to see here move along. Respect the family! C’mon man don’t you have feelings? “the FBI is not investigating Rich’s murder — it is an MPD investigation. On 19 May 2017, the Rich family attorney sent Wheeler a cease and desist letter saying he had violated a contract forbidding him to publicly disclose information about the case and threatening to sue if he continues to do so. All claims made by Mr. Wheeler are false and take fake news to a whole new level. The family deserves better and everyday MPD continues to work diligently to solve this case. The assertions put forward by Mr. Wheeler are unfounded. The Metropolitan Police Department’s (MPD) Homicide Branch is actively investigating Mr. Rich’s murder and we continue to work with the family to bring closure to this case as we do with all homicide investigations. If there are any individuals who feel they have information, we urge them to call us at 202-727-9099 or text us at 50411. The department is offering a reward of up to $25,000 for information on this case that leads to the arrest and conviction of the person or persons responsible. lthough the Fox report claims Wheeler is a private investigator, a search for Wheeler’s name on the public lookup tool for licenses in Washington D.C. yields no results. We also checked for a license under his name in Maryland, where his firm Capitol Investigations is based. This search also yielded no results. When we asked MPD whether he was indeed a homicide detective with the department, they only confirmed he once worked there starting in 1990. He was dismissed by the department in 1995, but a spokesman did not explain why. WASHINGTON (INTELLIHUB) — A 4-year resident surgeon at Washington Hospital Center claims that Seth Rich was alive and recovering well in facility’s Intensive Care Unit (ICU) after being treated for a total of 3 routine gunshot wounds — that is until a number of law enforcement officers arrived eight hours later kicking most everyone out of the ICU and physically barring doctors and others from attending to Rich. The surgeon who witnessed this bizarre behavior decided to come forth with the information despite the fact that he or she may be easy to identify. No one here was allowed to see Seth except for my attending when he died. No code was called. I rounded on patients literally next door but was physically blocked from checking in on him. I’ve never seen anything like it before, and while I can’t say 100% that he was allowed to die, I don’t understand why he was treated like that. Take it how you may, /pol/, I’m just one low level doc. Something’s fishy though, that’s for sure. Golly golly. Aren’t you so concerned that the Rich case be ignored. Hmmm. So differed to the Russia investigations into ….. into…. well they dont know the crime yet. The democrats are vomiting with fear that they will face justice. And they will…..
No they don’t. But, our HIGHEST levels of law enforcement are investigating the Russia connection. And, you know what? If they thought a DC staffer was somehow complicit in this, I’m sure the FBI would be involved in that too. The fact that they aren’t speaks volumes about what they think. I am interested in the debunking of all conspiracy theories. They do our country no good. I am amazed at the amount of hysteria in the main stream press about this very very interesting story. It is a complete contrast to the unending baseless Russia conspiracy they bore us with. I hope there is a full and open investigation into the murder. Is that possible these days in a democrat controlled city? Do you consider the National Review part of the MSM? And, what do you mean a democrat controlled city? Seems like the Republicans are firmly in charge in the Capital. Only democrats quote national review. As for DC – umm – YES they have a democrat mayor and council. Otherwise we’d be seeing the democrat criminals locked up. Are you kidding me? Very few Dems even read that magazine. Anne betrays she’s clueless about National Review. It’s not “The” National Review. It’s National Review. So what? I read it. I write there. And I am interested in how their views on Trump are changing. That doesn’t make the site a Democratic one. Maybe the NR is beginning to see something you aren’t. I doubt it. I read both sides. I am mostly Republican, but differ sometimes in viewpoint. President Trump is doing quite a great job so far. Seth Rich was murdered while the Dems were in charge of the Executive Branch (July 10, 2016). I am only surprised he wasn’t killed with a baseball bat – to put a colorful explanation point on it. (Robert De Niro, The Untouchables). The Clinton mob definitely fits the gangster image. You avoided my question. The National Review has debunked it as well. Obama may have been the President. But Republicans were still in control of Congress last summer. If the FBI thought this story was connected to their Russian investigation, I’m sure they’d be all over it. Remember…both Comey and the head of the CIA are Republicans. Even the conservative National Review says this story is total bunk. Good for the National Review. Its also interesting how mums the word the DCP is. If it truly is a botched robbery then publicize the heck out of all information in the hopes citizens can turn in the killers. If its a truly a botched robbery and the police are stumped release information to the public so that they can possibly help. There was a TV show America’s Most Wanted which worked pretty good. To those who debunk “conspiracy theories” that Seth was just a the wrong place at the wrong time. Please answer me : Who, why killed Seth Rich ? Most if not all murders/crime that happened in political arena, weren’t solved. Why ? Many murders, political or not, remain unsolved. We don’t know who killed Seth Rich. We do know that the story was withdrawn as a piece of shoddy journalism. Go read the post from llatpoh – Let me guess, nothing there as well. Only trolls resident or temporary ones will comment like this. So, we silence freedom of speech by calling people ‘trolls’ when we don’t like or agree with a differing opinion? I call that being a bully. You come to this website and you just go against everyone and everything. In fact you offer nothing with your new age beliefs. We aren’t changing you and you sure aren’t changing us. Its best we part ways. So, let me see an article from a reliable source that names the hospital and the staff. I said somewhere else around here that, in a busy hospital, you aren’t going to get law enforcement officers arriving and kicking people out of a room without a great number of hospital staff being witness to that event. The last time you agreed that its the Advertisers that pressure Fox to stop the news, now its shoddy journalism ? Why is it shoddy ? They interviewed the PI employed by the Rich family not someone else who have “opinions”. You want to see shoddy journalism ? go to all the other MSM. You were right in the sense that advertisers were pulling out. They likely saw the writing on the wall, so to speak, that continuing to advertise on a site with blatantly fake conspiracy theories was not going to a) make them money, b) win them customers and c) give their companies a good name. They were smart actually. And, in addition, Fox stated that this ‘story’ was not up to their journalistic standards. That is a nice way to say it was shoddy journalism. —- A 4-year resident surgeon at Washington Hospital Center claims that Seth Rich was alive and recovering well in facility’s Intensive Care Unit (ICU) after being treated for a total of 3 routine gunshot wounds — that is until a number of law enforcement officers arrived eight hours later kicking most everyone out of the ICU and physically barring doctors and others from attending to Rich. So did this person go to the police? Why is this not widely reported in the media? Surely this ‘resident’ wouldn’t be the only one at a busy hospital that observed this if it were true. I use to work in a hospital and you ‘can’t keep things secret’ there. Ain’t possible. You know, anyone can anonymously post and claim ANYTHING with little to no consequences. And, people that are eager to believe will lap it up. There was a murder of a US President, in 1963, that was covered up. More than three thousand people were murdered on 9/11, and that was covered up. I don’t know who killed Rich, or why. But if it was someone with the right connections to people in power, it will be covered up too, unless the people in power want the truth told. Why is it that some elements of our country just seem to believe baseless stories rather than the truth? What are you getting out of it? Excellent write up, Rachel! Amazingly, yours WAS on the first page of google search: Did Seth Reach give dnc emails to wikileaks? …at the very bottom, but every single other hit started with: Conspiracy theory of wukileaks source being Seth Rich…, or, Crazy idea about Seth Rich debunked… ETC.! So, you can believe google is doing Their part, lol! Wow! Thanks so much for letting me know. The Stream hasn’t been let into Google News yet, unfortunately, but to show up that high in regular Google results is pretty amazing. We have a great team that truly understands SEO. And you Won’t be with more pieces like this! They are actively trying to squelch this story! No one is trying to squelch it. See my reply above Rachel. Google ALSO filters your searches, did you know that? So, for instance, if I do a google search of Seth Rich murder, I don’t get Rachel’s write up as the first thing I see. I get articles by Wikipedia, the Washington Post and Think Progress. That is likely because I read a lot of articles on those sites. So, if you are getting articles on conspiracy theories re: Rich and they are popping up first, it is likely because you frequent those sites. We should have listened to this guy a LONG time ago! Seth’s parents, out of respect for their son — and to honor him — should get on board. The Russian hack story is an obvious political hoax. It was a DNC insider — a true American — who leaked the damaging information to WikiLeaks. If evidence proves that was Seth, what a son! …one who laid down his life for the good of his country and fellowman! …making appear an awesome living example! Not at all what Podesta had in mind! Seth’s family has been threatened by DNC. Every reliable news source has debunked this…including Fox. And, it is being reported on multiple sites that a number of Fox reporters are quite upset about the elements of Fox (i.e., Hannity) that continue to push this. Looks like they freaked out over the Murder and launched the “Russian Collusion” story to cover themselves, once they realized they lost. Well, I don’t see the FBI or CIA doing anything at all on the Rich murder. However, that is not true for the Trump / Russia connection. Raise your hand if you believe you know who did it, and why! Funny that in light of ALL of this Seth Rich evidence that’s being uncovered and points to the DNC…and in light of the multitude of PROVEN crimes of Hillary Clinton…and the SUCCESSFUL Clinton/DNC conspiracy to rob Sanders of the nomination…and Runwaygate…and Benghazi…and the Clinton Foundation…etc. The FBI is focused on these few less-than-whispy RUMORS of Trump/Russia and are wasting untold resources unsuccessfully TRYING to make something stick!